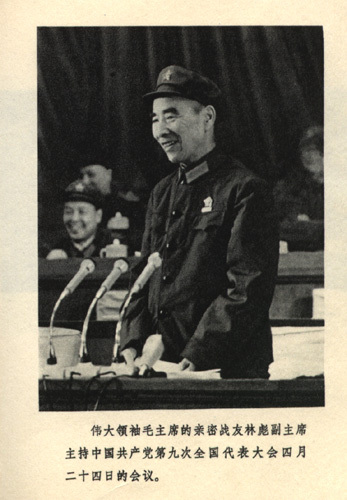 Lin Biao, born in 1908, was a field marshal in the People’s Liberation Army during the China’s people’s war. Following the 1949 success of the revolution he rose in ranks to eventually become second to Mao in the Chinese Communist Party. A proponent of the left during the Cultural Revolution and of a ‘global people’s war’ model of foreign policy, Lin disappeared in September of 1971, shortly before China’s official rapprochement with the United States, implementation of a reactionary foreign policy based on the ‘Three Worlds Theory,’ and the final curtailing of the revolutionary mass movements. The general line of most nominal Maoists inside and out of the now-defunct Revolutionary Internationalist Movement has been to accept the official story proposed by the Chinese Communist Party under Mao during the last years of his life: that Lin plotted a counter-revolutionary coup against Mao, once discovered attempted to flee by airplane to the Soviet Union, and crashed and died en route. Within the context of this negative consensus regarding Lin, the crypto-Trotskyist personality cult around Bob Avakian, the ‘Revolutionary Communist Party-USA,’ frequently used the term the ‘Lin Biaoist’ as an allegorical pejorative for the original Maoist Internationalist Movement (which was incidentally the original ‘Revolutionary International Movement’), the predecessor of today’s Maoist-Third Worldist and Revolutionary Anti-Imperialist movements. MIM itself held tight to the ‘official’ narrative surrounding Lin Biao and claimed, like most Maoist movements today, that socialism was dismantled following Mao’s death via a coup and not in some regards before with Mao’s consent. In many ways, MIM was shooting itself in the foot by not more carefully looking into the Lin Biao incident in the context of the reversal of socialism in China. Members of the Revolutionary Anti-Imperialist Movement have long distributed copies and selections from Lin’s seminal 1965 essay, Long Live the Victory of People’s War!, as part of an effort to promote a Third Worldist outlook on revolution, i.e., one that sees the Third World masses as the core social base of global anti-imperialist revolution. Whereas Lin in 1965 vaguely stated that “the proletarian revolutionary movement has for various reasons been temporarily held back in the North American and West European capitalist countries,” today we can confidently say that this is due primarily to the fact that a portion of surplus value taken from super-exploited workers in the Third World is included in the incomes of large majorities of people in core imperialist countries. Even members of the working class of First World countries are effectively net-exploiters whose existence is partially dependent on imperialist exploitation of a Third World-centered proletariat. That is not to say that this will always be the case. But as logically implied by Lin, the tide of First World material embourgeoisment will recede as the “torrential flood” of Third World revolutions carries forward. The suggestion by Gran Marcha Hacia el Comunismo to reassess the 1971 Lin Biao incident should be seriously considered by all forces fighting for national liberation, emancipation from imperialism, and communism. I hope a wider discussion on the circumstances and implications of the death of Lin Biao not only sheds light onto the reversal of socialism in China but also encourages a better strategic orientation on the part of international revolutionary forces today.